Reports reports reports. One of the critical functions of your Salesforce database is to generate reports that will give you accurate, useful information about your constituents, products, and services. I am trying to report on how many contacts 65 years of age and older live in households that have received services in the last year. Example: Jim is 70 years old. His wife Franny is 72. They live with their daughter Sara, who is 50 years old and who received food services last year. Case record: connected to Sara’s Contact record, and to the Household Account record. How do I get the report to count Jim and Franny when they are not in the Case loop, so to speak? Hmmm, could we do this with a standard Salesforce report? What if we create a report on Account, with cross filters to find Accounts with Cases, and Accounts with Contacts over 65? When we run this report, we want to see a result of 2, since there are 2 contacts over 65 in a household with services. Standard Salesforce report results — gives us count of Accounts, not count of Contacts. Darn it. What can we do? Apsona Single-Step Reporting to the Rescue! Fortunately, there’s Apsona. Apsona’s incredibly powerful reporting tool will give us exactly the results we want, and then some. Follow along to see how! From the Apsona tab, click on Accounts, and choose Reports. Right off the bat with Apsona reporting, we have the ability to choose fields not just from our base Account object, but from any object that has any kind of relationship to Account — without having to create a special report type. All of these related objects are provided right there for you. Think about it — this includes any objects that have a lookup or Master/Detail relationship to Account, as well as any objects that the Account has a lookup to. Powerful! Fantastic, but how do we get the count of Contacts we’re looking for? In the Available Objects list, choose Contact via Account. The help text shows that this is any Contact record that’s related to the Account via its Account lookup field. In other words, any Contact in the Household Account — exactly what we want. That is the magic that will make this report work: displaying the # Records field, and choosing the Contact via Account related object. Of course, we still need to add report filters to make sure we’re only getting Contacts over 65, and only those in Households that have Cases. But how great is it that we can so easily pull metrics such as record count from related objects? As long as we’re here, why not display the Contacts’ names and ages? Click in the Add column picklist to bring up the Add Column dialog. As an aside, another lovely feature of Apsona reporting is the ability to change report column names. Simply hover over the column whose name you wish to change, click on the arrow, and type in the new column name of your choice. On the Filter Terms tab, click the Add Term link. Next we want to make sure we only see Contacts in Household Accounts where at least one Contact has received services, In Salesforce terms, where there is at least one Case associated with the Household Account. Click the Add Term link again, and this time, choose Case in the Available Objects list. The Metrics options open up. Choose # Records, and finish the filter criteria. Since we want both conditions to be true, we’ll leave the Filter logic as is. Part 3: Run the Report! We’ve chosen the fields to display, and set our filter terms. Let’s test it out! Voila! Our Apsona report gives us the results we were aiming for — number of Contacts in households that received services. And, as you can see, you can easily add other fields related to Contacts to verify your data and make your report even more useful. So stop banging your head against the wall over standard Salesforce reports — and start making use of the power of Apsona reports today! Picture this: your annual auction has been a huge success. Congratulations! You have a spreadsheet chock full of donors with all their contact information, along with the items they won and additional donations they made. Some of these donors are new to you; some have been loyal fans of your organization for years. Now it’s time to get all that mission-critical data into Salesforce, so you can be sure to thank everyone and keep in touch with them for next year’s auction and other events. The idea of data import can be daunting. Especially when you know you have duplicate rows of Contacts in your spreadsheet because of generous donors who won more than one item and donated during the Raise the Paddle session. And, some of your donors are already in your database, while some are new to you. How can you be sure you import only one record for each unique Contact in your spreadsheet, and avoid importing Contact records for people who are already in Salesforce? And how can you match the newly imported or existing Contact records in Salesforce with their donations in your spreadsheet? Seamless handling of duplicate records. During the import process, Apsona detects duplicate rows in your spreadsheet, based on matching criteria you provide. Not only that, it checks your spreadsheet against existing records in the database to avoid creating new duplicates. The Echo File: associates new record IDs with each relevant row in the spreadsheet. This means if you have three rows in your spreadsheet with David Smith as the Contact, Apsona will import just one David Smith Contact record — and then return an “echo file” with the new Contact ID filled in for each of the three David Smith rows. This makes import of related data, such as David Smith’s donations, a breeze. Add columns on the fly during import. Have you ever started an import, and then realized part way through the process that you were missing a crucial field? And had to back out and start all over again? With Apsona, you can add missing columns on the fly without having to leave the import screen. Let’s see how all of this works! We’ll begin by importing our donors as Contact records. As we recall, we have multiple rows in our spreadsheet with the same donor. On the Apsona tab, click on Contacts. From the Tools menu on the right, choose Import/Update. On this first import screen we’ll choose “Reject” as the option for how to handle Duplicates. This is what tells Apsona that if there are multiple rows in our spreadsheet with the same Contact, it should import just one of them. Not only that, Apsona is sophisticated enough to determine if you already have a Contact record for that donor — and not import another one. What a time-saver! Once we’ve chosen our spreadsheet as the Data Source, we can click Next and move on to data mapping. Apsona will automatically detect if the column names in our spreadsheet match the Salesforce field names, and map them accordingly. You can change the mappings, of course, to import into whatever fields you like. Since First Name, Last Name, and Email are set correctly here, we’ll leave those alone. The Donation related fields — Donation Amount and Type — are also set correctly to Do Not Import. These fields will be handled when we import the donation data in a subsequent step. From the Data Errors dialogue, we see that Apsona, as promised, recognizes duplicate rows in our spreadsheet. Not only that, it has also determined that we already have an existing Contact record for one of our donors. Excellent! Now that we’ve validated our data, we can choose Omit Erroneous Records in the On data errors picklist and click Next to get to the final step of Contact import. The Echo File: associates new record IDs with each relevant row in the spreadsheet. Always download the import results! This is your “Echo File,” which contains the Contact IDs that will make importing related Donation records a breeze. Notice that two columns have been added: Import Result, and Contact ID. And notice that the Contact ID for John Smith has been included for each John Smith row — even though the second John Smith record was not inserted. We also have the Contact ID for Barbara Wells, our existing Contact. And finally, even though we didn’t insert any Donation data on this round, the Donation columns are included in the Echo File. Since we have all of our Contact IDs included in this handy Echo File along with all of our data, associating Donation records with the right Contact will be a snap. Just use the Echo File as the Data Source to import the Donations. Donation import: use the Contact ID provided in the Echo File to associate the Contact with the Donation. For each missing column, choose the field name and enter a value. But wait, what about the Opportunity Name field? We don’t want the same value for every row for this field. Apsona has taken care of this too with another handy feature, which allows you to reference the values of other fields in the new field value. Our organization’s Opportunity naming convention is Donor First Name, Donor Last Name, Amount, and Record Type. For example, the Donation record for the first row would be named John Smith 100 Auction Item. Voila! Apsona creates the Opportunity Name column, with the correct values filled in. As an added bonus, if you are using the Non Profit Success Pack, Opportunity Contact Role records will automatically be created when you import the new Opportunity records. The Primary Contact will be set to the Contact you designated, with the default role of Donor, and the Primary checkbox will be checked. As you can see, Apsona’s smart Data Import tool make it easy to import spreadsheets of related data, such as donors and their donation records — even when some of the data is duplicated. And with the ability to add columns to the import on the fly without having to edit the original data file, the import is even easier. Segment, slice and dice your data at will with Apsona’s Charting and dashboard add-on. This new add-on is the latest entrant to the Apsona suite of products. The question we were frequently asked was, “As Apsona reporting is so powerful, why can we not see the report data as charts and in dashboards?” Now, with Apsona’s Charting and dashboards, you can visualize and analyze your data in real time, right within your Salesforce org in your browser – there is no exchange of data with an external data warehouse. Apsona charting supports several types of charts – horizontal and vertical bar charts, pie and line charts, KPI’s and Pivot tables. More chart types are on the way. You can create powerful charts with it – charts that cannot be constructed with native Salesforce. One example that comes to mind is a chart with multiple “layers”. A multi-layer chart is one that contains two or more charts overlaid on each other. For example, you can create a two-layer chart with one layer containing Campaign and expenditure information, overlaid with a second layer containing Campaign and Opportunity revenue information. This way, you can get a side-by-side view of two related metrics (expenditure and revenue) in the same chart – even if those metrics are not available from the same report or object. You can also apply filter conditions to each layer if required. Layers can be added to vertical and horizontal bar charts. Another powerful visualization available is the pivot table. With this device, you can use multiple dimensions in the rows and columns and metrics in the cells. You can also use multiple metrics in the cells, and essentially get all of the benefits of an Excel pivot table right in your browser. Most organizations set goals and use metrics to measure performance towards those goals. This is where dashboards come in handy. You can now present the storyboard of your data as an Apsona dashboard. An Apsona dashboard is basically a collection of Apsona charts. It can include a combination of charts, and can easily be edited and previewed, and its charts resized and repositioned. You can add an Apsona dashboard to a Salesforce Home page and also as a related list in a Salesforce object. To try out Apsona Charting and dashboards, please click the Feedback link in Apsona for Salesforce and send us a request. We look forward to feedback and suggestions on this add-on. As 2014 draws to a close, we thought you’d be happy to hear from the two Apsona elves that are hard at work creating new features to serve you better. So here are some features you might like. The field selector for creating filters and for adding fields to reports is now easier to use as well as searchable for both objects and fields. You might look at the screen shots in our documentation, and better yet, try it out! Administrators can now manage their Document and Mail merge licenses from within the Apsona application. Document and Excel merge actions can now be invoked directly from either a detail page button or a Salesforce sidebar component, e.g., from the left side of your Salesforce home page. Visit our website for more information about this. You can now generate address labels from the document merge tool. As always, if you see bugs or glitches, or have questions or suggestions, please do not hesitate to contact us. Thank you for supporting the Apsona apps. Wish you the very best for 2015 and beyond. Apsona’s new merge tool allows you to quickly generate Word, Excel and email directly from your Salesforce org. You can generate end-of-year tax summaries and thank-you letters to your donors, or a proposal or quote to your customer, as a Word document. 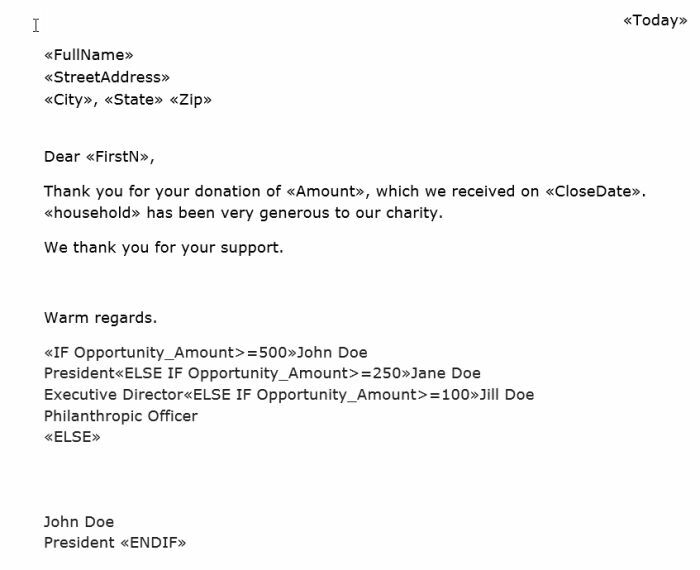 You can choose to send donors an email via a HTML template if you want to go paperless. And you can also render your pledged and posted donations into a multi-sheet Excel report, complete with charts and pivot tables. All of this functionality is included in one package – Apsona Document and Mail Merge. Here are some of the key benefits of the Apsona merge add-on. Entirely browser-based: The merge process works entirely within your browser, and has no interaction with any external services. So your data never leaves your browser. This is unlike many competing products, which typically ferry your data over to the vendor’s server and carry out the merge process there. Flexible field naming in templates: Template building is quick and easy: you don’t need to adhere to any particular naming convention of Salesforce field names. When you create the template, you simply make up any field names you want, and Apsona will discover those names and let you match them with data fields. Compatible with existing templates: If you have already created document templates for competing products, Apsona’s merge tool can usually use them directly with no change. Powerful data retrieval ability: You can leverage Apsona’s powerful reporting capabilities as the data source for the merges. Data can be retrieved directly from a Salesforce object, or from any Apsona report – single step or multi-step. Thus you can combine fields from multiple objects into one template. You can even include calculated (aggregate) fields such as total donation amount in the last six months, or the most recent gift date last year – calculations that might not be available through roll-up fields. Filters can be added to an existing merge on the fly. To include a list of donations by the contact, you can build a table in the document template. The rows of the table might contain Donation merge fields, such as amount, payment method and donation date. As with other similar products, the leftmost cell in the table should include the TableStart field, which specifies a record group name following a colon. The rightmost cell in the table should similarly include the TableEnd field. These two markers indicate the region of the document that must be replicated, once for each Donation. The data source for a template can be obtained from pre-built Apsona reports, or directly from an object. For example, the Contact information can come from the Contact object, and the list of donations can be obtained from a Donation report. Before running a pre-built merge template, you can also apply additional filter terms that are not specified in the Donation report. You can also generate customized emails using email templates stored in your Salesforce Communication Templates. As with documents, the tool can recognize merge fields in the email template and generate customized emails from the corresponding data. It can even attach a generated Word document with a generated email before sending it off. It can also handle email templates made with letterheads. A system administrator can set up merge actions using templates and their data sources, and all that the end user has to do is run an existing merge action whenever the need arises. The administrator can also manage merge actions, e.g., identify unused ones and delete them. You can try out the Document merge, Excel merge, Email merge and Email and Document merge when you download the Apsona for Salesforce app from the AppExchange. For more details, please visit our website or email us at support@apsona.com. We would like to thank Idealist Consulting for hosting this blog entry. Building Salesforce reports can sometimes be very challenging. You start building a report and you realize you cannot access the objects you want, or use the appropriate lookups, or apply the relevant filter criteria. Apsona Multi-step Reporting (MSR) addresses some of these problems. This reporting app lets you build reports spanning any number of objects, native or custom. It lets you traverse dependencies in either direction (parent-to-child or child-to-parent), and can handle multiple dependencies between the same pairs of objects. For example, you can create a report spanning the Campaign (parent) – Opportunity (child) – Opportunity Contact Role and back up the chain to Contact (parent). Another plus with Apsona MSR is the ability to run reports without having to create report types. Reports are built in steps. Each step retrieves data from one object. Each step carries its own filter conditions, independent of the other steps, and these conditions can be cross-object. Steps are linked to previous steps via lookup fields or picklist values. We will use an example to illustrate these ideas. Frequently, non-profit organizations need to identify their top donors and learn their interests, so that the organization can target the right people in future campaigns. In that context, they often need to identify donors who donated in multiple campaigns, or those who have donated to two or more specific campaigns. As a simplified example, suppose we are conducting a dinner gala, to which we would like to invite our top donors from the Kids Literacy and the School supplies Campaigns. So we want a list of those donors who have contributed in both the campaigns. Intuition suggests that we can produce this report by first creating two lists of donors, one for each campaign, and then identifying the common ones. And this is precisely how you would build a multi-step report for this purpose. The Opportunity Contact Role (OCR) object is the basis of this report, since an entry in that object tells us the existence of a donation by a donor. The Donation object has a lookup to Campaign, and therefore accessible from the OCR object. So here are the three steps of the multi-step report. Find the donors for Kids Literacy. From the OCR object, get the Donor/Contact look up field. From the Donor object, get the donor’s Full Name. In the filter terms, select the Campaign field from the Opportunity object and select Kids Literacy as the value. Save the step. Find the donors for School Supplies. Clone Step 1 and just change the filter term value of the Campaign to School supplies. Save the step. Find the donors in both campaigns. From the Contact object, select the Contact ID field (required for linking to the previous steps), Full name and any other Contact fields you require for the report. Click the linkages tab. You will now see that you have two linkage options, one from each step. Notice that this is where we use the lookup field values retrieved by the previous two steps. You will need to select both the linkages, to enforce the condition that you want contacts from both campaigns. Save and run the report, and you have your desired results. Notice that this report retrieves data twice from the same object (Opportunity Contact Role), with different filter criteria. This capability is needed frequently in real-world situations. In addition, Multi-step Report data can be visualized in charts, groups, and pivoted matrices. We would like to thank Idealist Consulting for the opportunity to contribute this article to their blog.